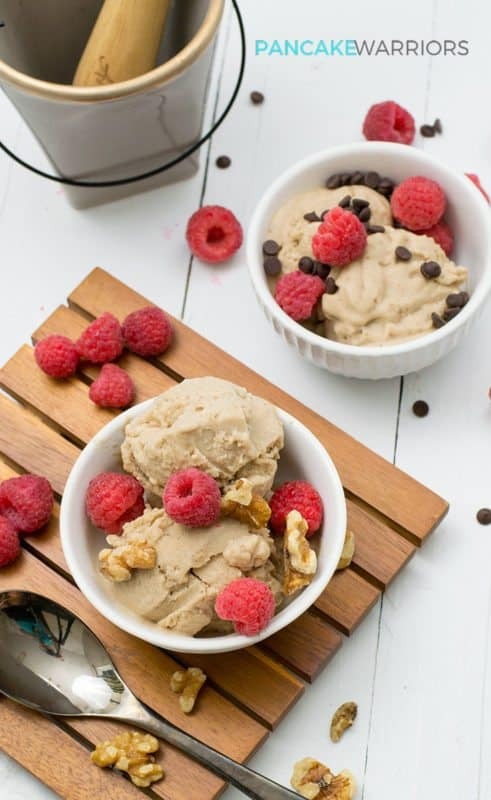 Cool off this summer with this simple vegan walnut banana ice cream recipe! You won’t believe how easy it is and you are going to love that there are no added sugars and you won’t need a ice cream maker to enjoy this! Vegan, gluten free, grain free, dairy free and oh so yummy! I’ve been making banana ice cream or nice cream for years. Every year around this time I buy 2-3 extra pounds of bananas, peel them, slice them and freeze them so anytime I have a craving for somethng cold and satisfying, I can have banana ice cream and feel no guilt about over indluging every single night of the week. Lately I’ve been adding a secret ingredient to my banana ice cream to make it even more filling and also the perfect post workout fuel – protein powder! I use just half of a scoop of vanilla protein powder to my usual banana ice cream recipe. The recipe gets a little thicker and it’s a little sweeter from the stevia in the protein powder, but still has that amazing soft serve ice cream texture! How to make this even better for you? Walnuts! Yup walnuts are a great source of healthy fats! Omega-3 fatty acids to be exact. Healthy fats tend to help you feel satisfied and nourished, so adding them to a sweet dessert is the perfect way to increase your satisfaction without going overboard. Because let’s be hones, it’s so easy to go crazy with fun toppings in the summer at your local frozen yogurt store right? 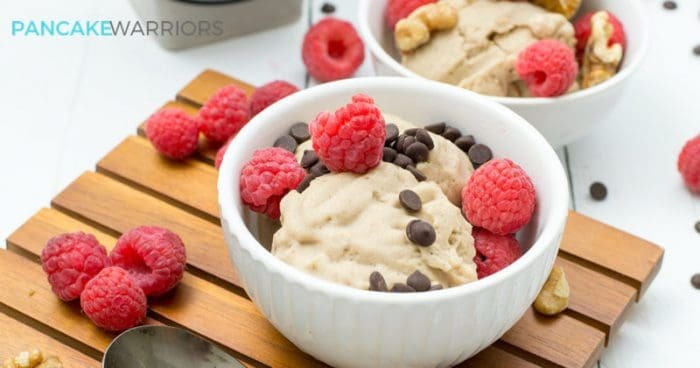 Well this simple vegan walnut banana ice cream is easy enough to make that you won’t have to take that trip to the frozen yogurt store as often, and your waist line might actually start to shrink if you eat this every night instead of your typical sweet treat. Love this idea of making your own ice cream at home? So did my clients! I’ve had so many clients make my cherry chocolate chunk ice cream recipe on a hot evening. If you haven’t tried it yet you have to! 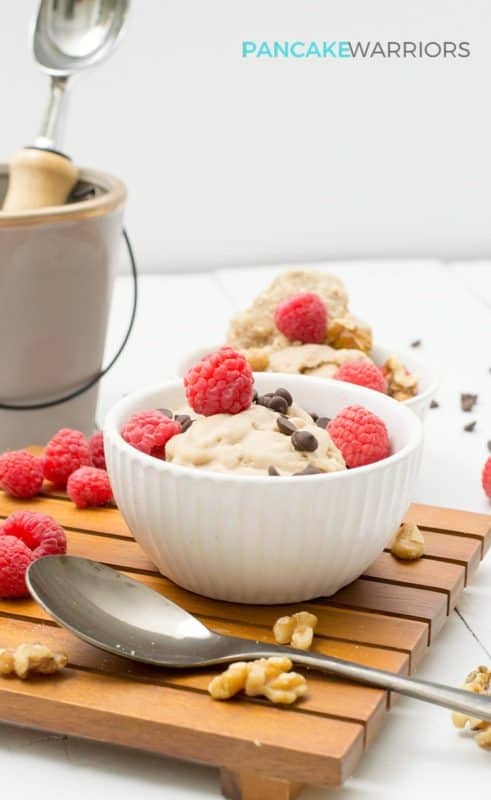 To make this simple vegan walnut banana ice cream you will need a food processor, some frozen banana coins, milk (of choice), protein powder, walnuts and whatever other toppings you want. Let your bananas sit out on the counter for about 3-4 minutes to slightly defrost to make this easier to process. Once the frozen bananas make rice like consistency, add the milk and process quickly! Add the protein powder and be ready to enjoy immediately or you can store it in the freezer for 1-2 hours to get the consistency you desire. If you let this sit in the freezer more than 1-2 hours, it’s going to be rock solid. If that happens, let it defrost slightly and use the banana ice cream in a green smoothie instead! 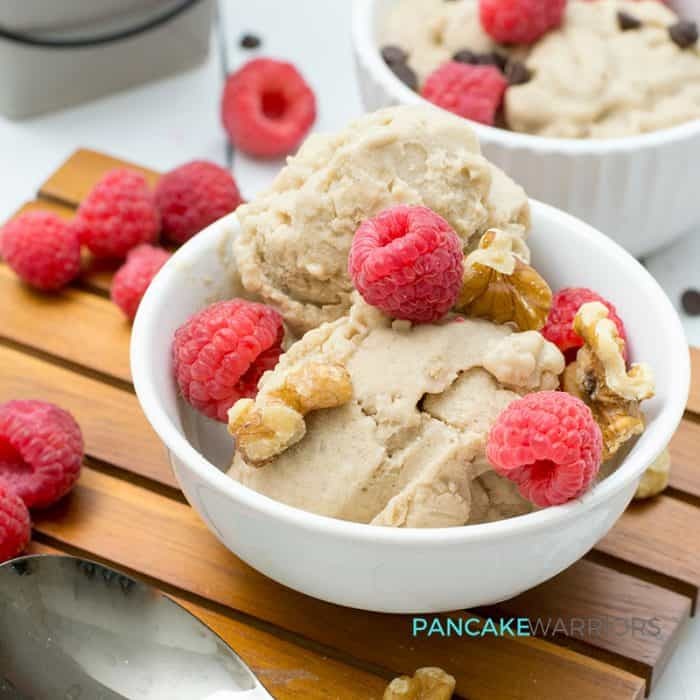 Enjoy this simple vegan walnut banana ice cream for dessert tonight! Easy to make, gluten free, paleo, vegan, dairy free and grain free this ice cream will make even the pickiest eater happy! Freeze the banana coins until solid. Once bananas are frozen, defrost 3-4 minutes before adding to a food processor. Process by pulsing until form a rice like texture. Add milk and process until smooth. Add protein powder and pulse until smooth. Top with walnuts and fruit, serve immediately.